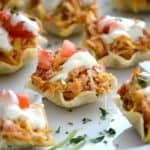 These Chicken Enchilada Bites are great little bite-sized appetizers with chicken cooked in the slow cooker and made with ingredients from Old El Paso™. 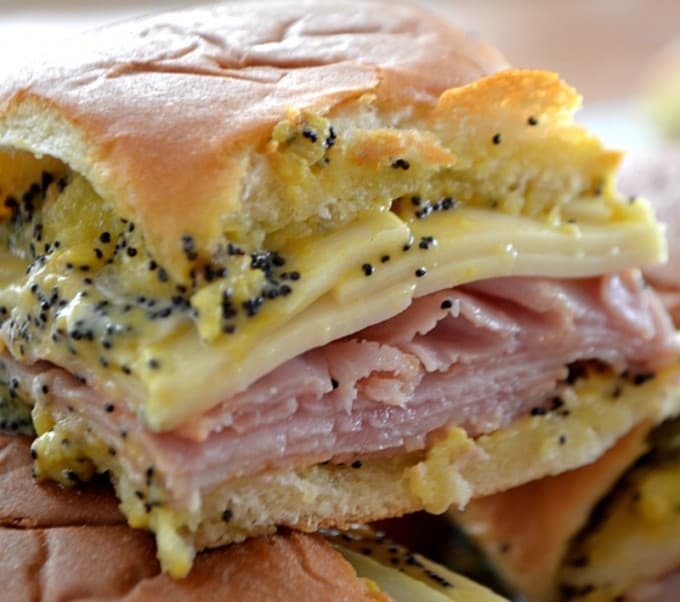 These will spice up your Game Day and help feed your hungry crowd! I’m excited for the big football games coming up, are you? I also have two men here in the house who are over the moon excited. I have to admit that I’m just a wee bit jealous, but do much better watching the game on tv as opposed to being in the stands. Yes, there’s something special about actually being there and experiencing it all, but all too often I find myself people watching more than I watch the game. It happens anytime we go to a sporting event. I just get a little side tracked. So, I’ll be in the warmth of our home here in Phoenix thinking of them in the chilly outdoors. I was at my local Albertsons the other day when I found myself thinking about Mexican food and specifically enchiladas. While I love making them, I wanted to figure out a way to make them into a finger food that the family could eat while snacking during the game. These are the perfect bite-sized food. 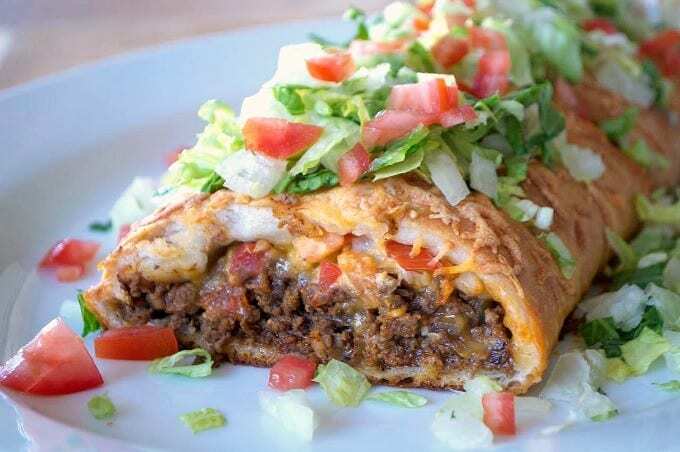 They have lots of flavor and when topped with that creamy enchilada sauce, have a little bit of a kick, and can fill you up in a hurry! I was able to get all the ingredients I needed in that one trip to Albertsons. Score! 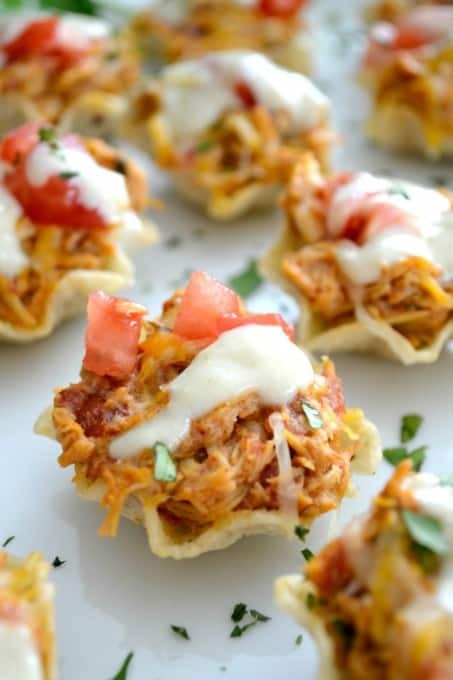 These are SO very easy to make, especially since the slow cooker is a large part of the process. This will allow you to do other things (like relax, haha) before your guests arrive and the game starts. I love putting my slow cooker to work and can never seem to have enough chicken recipes for it. This Slow Cooker Honey Garlic Chicken is sure to help feed your hungry crowd. I love the flavor combinations. It amazes me that you can cook a Whole Chicken in a Slow Cooker. SO cool that you can make such an easy dinner. This Slow Cooker Enchilada Soup is a great variation of enchiladas and will be a lot of fun to eat, too! 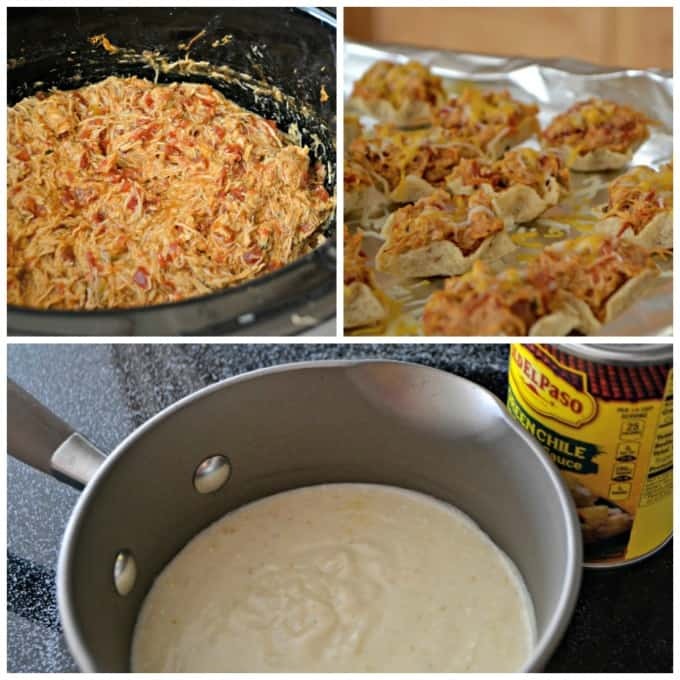 The perfect Game Day appetizer - Chicken Enchilada Bites with a Green Chile Enchilada Cream Sauce! 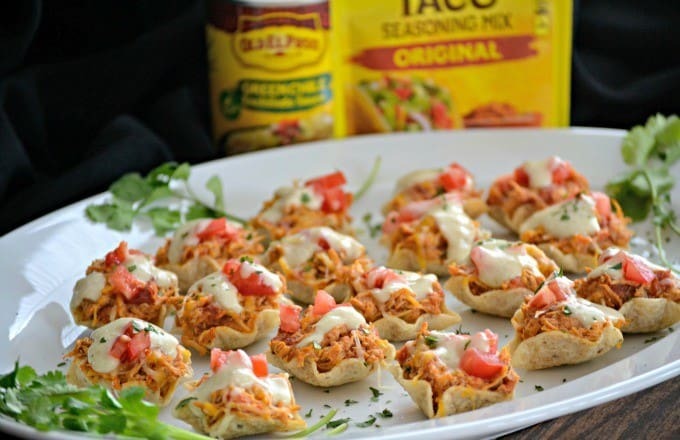 Generously rub the taco seasoning onto the chicken breasts, so that they are well coated. Place into the slow cooker in a single layer, if possible. Pour the tomatoes over the chicken. Add the Old El Paso Mild Enchilada Sauce. Cook on high for 3 hours or low for 6 hours, stirring once or twice. Remove chicken from crockpot and shred with a blender or two forks. Mix the tablespoon of cornstarch with the two tablespoons of cold water. Mix thoroughly, add to slow cooker and stir. 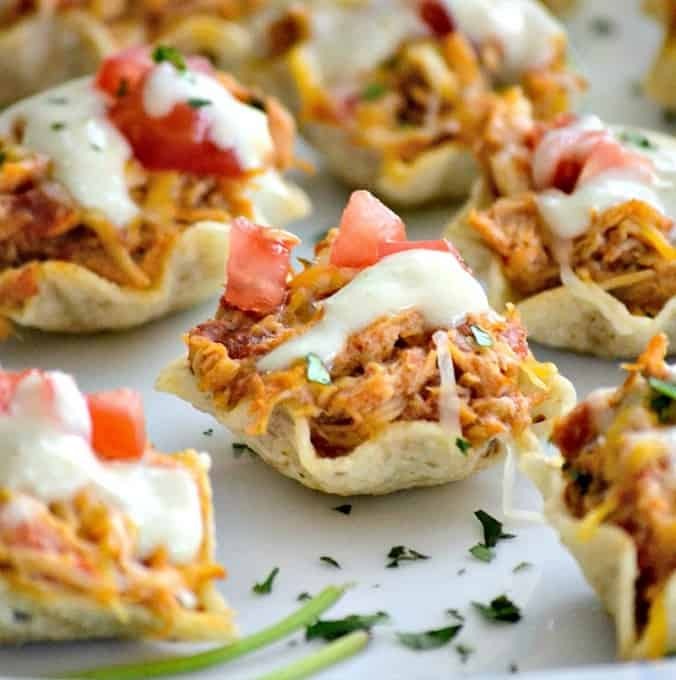 Return the shredded chicken to the slow cooker and cook for an additional half an hour. Add the can of Old El Paso Green Chile Enchilada Sauce and whisk until cheese is melted and sauce is well mixed. Reduce heat to low. Prepare a baking sheet with tin foil and preheat a broiler to low. 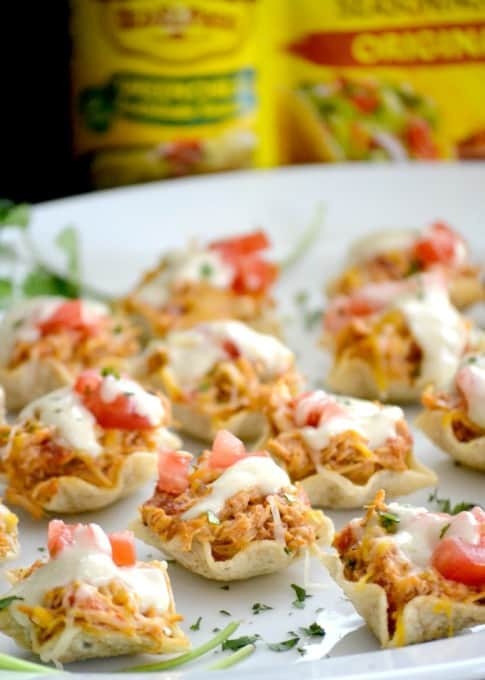 Arrange the tortilla scoops on the baking sheet and fill each with a tablespoon of the chicken mixture. Evenly distribute the shredded cheese among the scoops. Broil under low heat for 1-2 minutes, until cheese is melted. Top each scoop with a few diced tomatoes. Drizzle with the creamy enchilada sauce, sprinkle with chopped cilantro and serve. 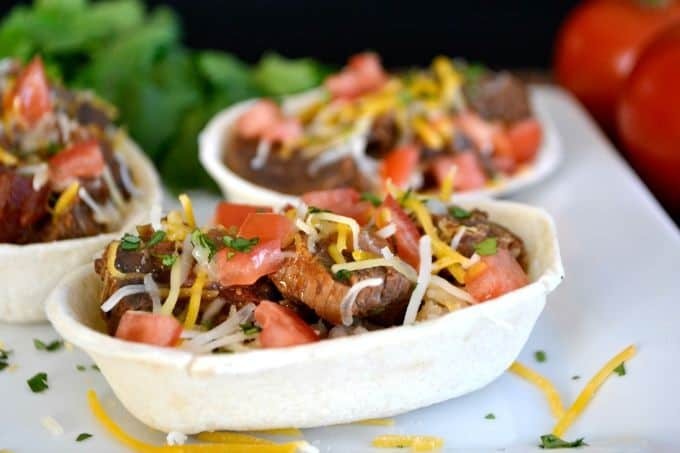 Fill the tortilla cups just before you are ready to serve them, otherwise the shells will become soggy if they sit for too long. Make these 3-Ingredient Nutella Brownies to serve at your Game Day party!